We are very lucky in the sponsorship marketing industry. We have access to a plethora of content and information. 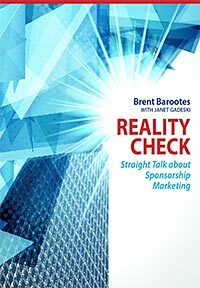 Canada’s own sponsorship publication The Sponsorship Report is an amazing resource published monthly by Mark Sabourin and his team. It carries all the Canadian sponsorship news and in-depth stories about people, places, and events within our industry. Brian Gainor’s Partnership Activation site is second to none for all great activation ideas and case studies from around the world and includes Canada as well. Another great source for sponsorship content, white papers, professional development calendars for events worldwide, and best practices can be found at the Partnership Group – Sponsorship Specialists™ web site. And of course, there is the granddaddy of them all and an amazing online resource, the IEG web site. It is chock full of content, great stories, articles, and white papers. Recently they published a wonderful piece on their website. It was a sponsor’s perspective on “The Attributes of a Good Property”-an interview they conducted with Dennis Bash, regional marketing manager for the Pacific Northwest for US Bank. I found it informative and valuable and want to share it with you. It is worth reading and understanding from a property perspective. 1. Know the value of your offering. When discussing a partnership, properties need to have a clear understanding of the value of their assets. To be sure, it’s in the seller’s interest to have a clear understanding of the value of their assets when negotiating a deal, he said. Properties have several options on valuing their offers. That includes hiring a third-party research firm, working with a local college or university or, for nonprofits, leveraging their boards of directors for agency contacts and pro bono work. 2. Take the position of a consultant. Once a partnership is secured, properties need to go beyond terms of the contract by looking out for the sponsor’s best interest. Instead of focusing on the fulfillment of deliverables, properties should position themselves as marketing partners by proactively suggesting activation programs that support a partner’s evolving needs. Bash points to the Oregon School Activities Assn. as an example. The organization approached the decision-maker about using the partnership to support the bank’s new S.T.A.R.T. savings program. 3. Host sponsor summits. Properties should host state of the union and other networking events to keep partners up-to-date on the relationship and facilitate cross-promotions and other business-building opportunities. For example, Oregon State University recently hosted a networking event for its corporate partners. The event-which featured presentations by outside speakers-was organized by Learfield Sports, OSU’s multimedia rights holder. While sponsor summits are commonplace in the sports world, other types of properties typically do not host them, he said. 4. Keep an open line of communication. Sometimes a thank you note and other forms of communication can go a long way in building a relationship. For example, Bash works with several nonprofits that send a thank you letter after receiving a rights payment. The nonprofits also include an update on the relationship. This interview clearly defines what a brand feels an ideal property would be. It helps properties understand what brands are looking for. It also should help brands understand what they should expect from the “ideal” property. This interview closely resembles what we expect to see live on stage during the He Said – She Said panel discussion on October 22 and 23 at the SMCC Western Sponsorship Congress™ in Calgary.